We’ve put together all our experience and the best from the internet and created a comprehensive guide to how to improve your freestyle swimming. 1, Don’t drag. This is the most important element in swimming. Think of your body as a boat, and your arms and legs as the oars / propulsion. If your body is half sinking in the water, the oars / propulsion have to work much harder, or might even be ineffective. It’s the basic principle of drag: it’s much easier to move your body when it is as parallel to the waterline as possible. Most beginners are not parallel, with their legs much deeper in the water. 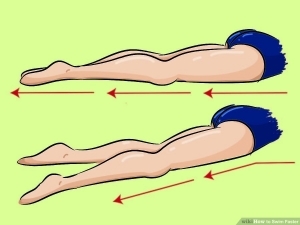 They are swimming at an angle, which is a huge disadvantage, you’ll need to kick harder to keep your legs up and will get out of breath faster. 2, Keep your head down. You literally want to look at the bottom of the pool. Most people lift their head at an angle; if you do this, your body will tip. 3, Learn to float. Practice simply floating with your body parallel to the water line, with your head down. 4, Kick on side drill. 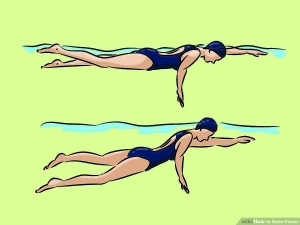 Once you can float without sinking move onto this drill. Wearing fins, stretch one arm out in front, the other should be relaxed by your side. 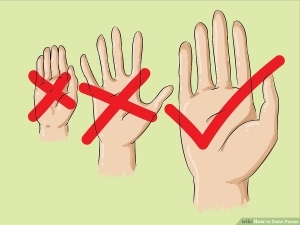 Make sure the palm is flat, parallel to the surface of the water and your fingers are relaxed and not pointing upwards. Your extended arm’s shoulder should be brushing your chin. Look down your arm so your eyes are parallel to the surface of the water and your body is rotated so you are on your side at 45-60 degrees. Your opposite arm’s shoulder should be out of the water behind you. Breathe by rotating your head every 4-6 seconds. Repeat on your other side. 5, Basics. Sounds simple but remember exhale with your face in the water, inhale when you turn your head. 6, Don’t lift your head. Don’t lift your head forward before rolling sideways to breathe. This frequent error also causes your hips and legs to drop. Roll sideways instead, and at the same time turn your head a bit farther, so that your mouth clears the water. 7, Rotate enough. When breathing turn your chin to your shoulder and leave one goggle in the water. This will stop you from lifting up your head and losing your horizontal plane in the water. 8, Take a full breath. It shouldn’t feel like you’re only getting half a breath. If it does, try rotating your body more so that when you breath, your hip is actually close to pointing to the ceiling. The rotation should happen just as your pull is ending, but before you bring your arm out of the water. This will allow more of your face to get out of the water without wrenching your neck too far to the side. 9, Weird timing. You shouldn’t be trying to get a breath while your arm is out of the water. Breath while your arm is pulling on the side that your arm is pulling. When your elbow starts to come out of the water at the beginning of your recovery, your head should go back in. 10, Hand entry. Think about it, when your hand is moving forward in the water, creating drag (rearward thrust) you want it to contact as few water molecules as possible. When it is moving rearward, creating thrust, you want it to contact as many water molecules as possible. 11, Think parallel bars. One of the most common mistakes with beginners and improvers is that your arms aren’t facing straight forward when they enter the water. They can tend to cross over towards or over the mid line which results in fishtailing from side to side and losing forward propulsion. Try to make sure your finger tips point towards the end of the pool on each stroke. 12, The catch. The tricky bit. When you start each stroke, your hand should enter the water at your arm’s fullest extension (extending your arm while your hand is underwater is inefficient due to resistance). Once your hand enters the water, you want your hand and forearm to be almost perpendicular to the water line. Your elbow should stay high; don’t extend your entire arm straight down. 13, The pull. 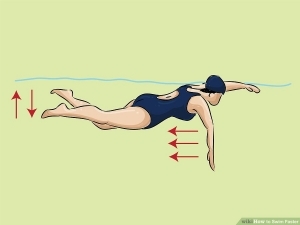 Once you’ve “caught” the water at the beginning of your stroke, you want to pull your arm through, all the way past your hip, for a fully extended stroke. Try to keep your elbow high throughout the entire pull. 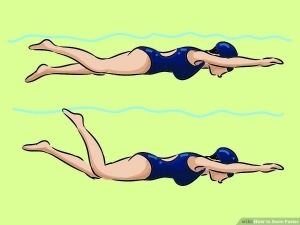 Some swimmers will try to do a fancy “S” stroke, but it’s much simpler to just focus on keeping your elbow high and your pull in line with the centre of your body. This should be achieved by rotating your body, not by crossing your arm across the centre line. Focus on NOT having your arms cross the centre line of your body, as this is inefficient. 14, Recovery. When you recover your hand at the end of the stroke, start by lifting your elbow first, and while keeping your wrist relaxed, bring your hand up past your head to extend in front of you without dropping your elbow. 15, Spread your fingers when you swim. By spreading your fingers slightly, instead of clamping them together, you create an “invisible web” that can help exert 53% more force! The ideal spacing is 20-40% of the diameter of the finger. 16, Rotation. Much of your power will come from proper body rotation. You want your hips to drive your rotation, not your arms. Your head should stay as still as possible, apart from breathing. If you’re rotating properly, the torque of the rotation helps you pull with your arms, and also helps you extend your arms as far as possible when you begin each stroke. To practice this, you can do a drill where you simply kick with your arms by your side, rotating from side to side. 17, Kick from the hips. Kicking should come from your hips, not your knees. Focus on keeping your feet extended and your knees relatively straight. Propulsion should come from your hips. You don’t need to worry about having a super strong kick. This is pretty hard to achieve and requires a lot of strength. For most people, the purpose of the kick will just be to keep your body position in a parallel line and prevent your lower body from sinking. 18, Relax. You should feel and look pretty relaxed when you swim. If your arms are moving like crazy all the time, you could probably benefit from some swimming drills. Try the “catch up” drill to slow things down. 19, Embrace youtube. Watch videos of elite swimmers or proper technique drills and see it all in action. 20, Film yourself. Get videoed yourself and see what exactly you are doing, we all think we are the perfect swimmer and doing just what we should but when you actually see it you will be able to recognize your flaws. Film yourself or consult a professional and who can do this and point out mistakes in your technique. 21, Attend a swim clinic. Get valuable stroke technique advice and meet other like-minded people as determined as you to improve their swimming. 22, Goggles. Go to a good swimming shop and ask to try a few different shapes and sizes of goggles. They are all shaped a little differently and some fit specific faces better than others. Hold a pair to your eyes and let the strap fall loose in front of you. Push them slightly into your face, a good fitting pair of goggles will stay put a couple of seconds before coming loose. 23, Wear a swim cap. Swim caps can make you more streamline and keep your hair out of your eyes but will also help protect it from the effects of chlorine and salt. 24, Buy a lap counting watch. Free yourself up from the drudgery of counting laps and even strokes to allow yourself to concentrate on technique. 25, Polyester is your friend. A good chlorine resistant swimming costume is a must, lycra perishes in chlorine so look for a 100% polyester or pbt fabric. They will outlast others considerably and no one wants a saggy bottom. 26, Fins. Short swim fins can help you achieve an efficient kick and avoid crossing over your feet. They can also improve ankle flexibility. They are also a must for technique drills as they will keep you moving through the water with minimal effort so you can concentrate on body position, rotation, arm and head motion. 27, Paddles. Swim paddles can increase arm strength but be careful not to over use and strain muscles. 28, Increase endurance. The best thing you can do to increase your endurance is to perform workouts with short rests between intervals. Try doing something as short as 6 x 1 lap with 5 seconds rest between and build it up. The goal of intervals is to enable you to swim longer distances while maintaining proper stroke. If you start out in poor shape and attempt to increase your endurance by swimming long distances without rest your stroke will deteriorate and you’ll get much less out of the workout. Is it good for you? Yes, better than nothing but intervals will see you improve much more quickly. 29, Increase strength. Turn a swim into a strength workout by adding strength work at the end of the lap. Swim 100m sets and instead of resting between sets do 10 vertical pushups. Keep your legs in the water and place hands flat on poolside shoulder width apart. Raise yourself up so your arms straighten, do 10 reps and straight into your next swim set. 30, Sustain your speed. Try a reduced rest workout, swim sets but decrease your rest by 5 seconds each interval. Try for one more each time you do it. 31, Work on your efficiency. The goal of this is to be more efficient in the water, you’ll need to work on covering more distance per stroke without getting any slower. Easier said than done, so try on shorter sets to start with. 32, Heartrate will be lower when swimming. When swimming your heartrate will be lower than it is when running or cycling even if you are putting out the same effort. This is because you are horizontal, supported by the water, cooled by the water and also because of the “dive reflex” which is a neurological response to immersion in water. It can be around 13% lower than on land- something like 17bpm. 33, Practice. Get in open water swims as much as possible. This will also increase your endurance because you’ll be swimming longer distances without the opportunity to rest. As a beginner, it was very easy to take a 2–5 second rest every few laps in the pool. Not so in open water; you got to keep going. 34, Sighting. This is a no-brainer and the most important aspect in open water. This was(is) tough for me because I always (as I am supposed to) breathe sideways. And popping my eyes up to see what is ahead really messes up my rhythm. It still does. If you can maintain your posture and the rhythm and still sight, that is a big advantage. 35, How often to sight? Try swimming (in the pool or open water) with your eyes closed. That will give you an indication of how straight you swim without any orientation aids. If you naturally swim pretty straight, you may not need to sight as much, but if you find yourself weaving quickly to one side or another, you should be sighting more frequently. 36, Swimming Straight. Sighting can help you swim straight but there are other aspects that you can incorporate in your swim that will help you stay straight. Practice breathing on both sides and although you may struggle at first you will swim in a straighter line. 37, Breathing Flexibility. If the sun is up one side, even with tinted goggles it can be quite bright. Therefore the ability to breathe on both sides helps. 38, Practice for nice calm strokes. It is very easy to panic in open water. Especially in the first few minutes. In the pool, you should practice to calm your nerves while swimming. 39, Add water. Pour water in the wetsuit before starting. A water film between neoprene and skin makes for better insulation than a dry suit. You can stretch your neck opening a little when you first get in to do this. 40, Slow down your kick. You will float better with a wetsuit so you don’t you’re your legs to help you float. Don’t kick like an outboard engine, splashing water = energy loss. 41, Think like a kayak. Faster swimmers resemble a kayak: perfect balance between paddling (stroke) and gliding, no bubbles, no splashing, all energy goes directly to push water . 42, Free speed from drafting. Drafting can save around 30% of your energy as the swimmer in front has already broken up the water tension for you. If you can find a slightly faster swimmer to draft off you’ll be able to keep up. 43, Practice for traffic. Practice swimming in an environment with lots of other people. In a race it’s easy to panic when you get swum into, elbowed or kicked- It can be like a washing machine. If you can get a couple of friends together try swimming 3 to a lane- all starting at the same time or go to the pool at peak times and make the most of a full lane rather than cursing it. 44, Don’t give up! When you first start at practice, you will feel exhausted and dead because swimming is so good for you and your body isn’t this used to it. Give it time. It may take 6 months to actually start feeling great at practice, but you just have to give it time. 45, Swimming makes you live longer! The more you swim, eat right and avoid smoking, the longer you’ll live, according to two studies of more than 355,000 people. You may add as many as 10 years to your life, says heart disease researcher Jeremiah Stamler, M.D., of Northwestern University in Chicago.